And how we wish were were joining our friends at Hendrick’s Gin today to celebrate the poetry and life of Rabbie on the Voyage of the Black Haggis. 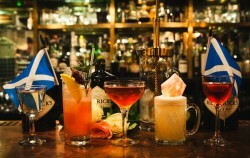 Under the expert guidance of Hendrick’s UK ambassador, Ally Martin, the voyage is intended to be a celebration of the unusual, allowing curiously minded individuals to gain a true appreciation for the peculiar – but oh so important – ritual of Burns’ ‘Address to the Haggis’ and its resemblance to the rituals behind the gin martini. Hendrick’s is uniquely able to offer a peculiar twist to toast Robert Burns. Infused with rose and cucumber, Hendrick’s is distilled in the Scottish village of Girvan – a stone’s throw away from Burns’ birthplace, Alloway. Martin’s arduous but illuminating voyage starts out in Edinburgh, and zig-zags its way down to London via Leeds and Manchester ending up in the renowned Hawskmoor in Spitalfields. . Each city will be treated to an inimitable event including bespoke cocktails and a Hendrick’s Haggis – a marvellous creation, crafted by Dram & Smoke that takes the humble haggis and adds the magic of Hendrick’s botanicals. We expect a full report tomorrow from those lucky enough to be on this journey!